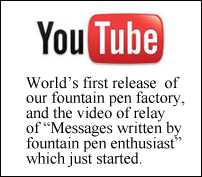 from Platinum Pens is coming soon. Each pen is a culmination of generations of skilled craftsman that have passed down the art of Kanazawa Leaf craft-works. Each piece is carefully hand crafted with the gold and sliver leafs from the ancient city of Kanazawa. The delicate gold and silver leafing are used to create a intricate portrait of Fujin Raijin , which means Wind God and Thunder God. 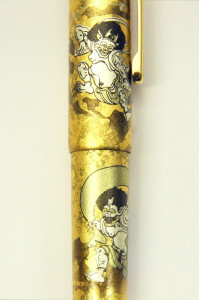 The attention to detail in these exquisite pens is unsurpassed and will make the #3776 CENTURY Fujin Raijin fountain pen a treasure to pass down for generations. The Fujin Raijin has 14 kt gold nib and trim, as well as the slip and seal cap mechanism which will allow you to use your pen and never worry about ink evaporation or damaging and clogging your nib. . The pen is available for pre-orders now and will be available in late October. Each pen is packaged in a Kiri Gift Box with gold converter as well as the manufactures one year warranty card.